Get EXCITED. We are running a video contest! Our loyal fans have great imaginations and we are eager to see what entries we get. Special prizes will be awarded! Click here to see some fun E3Live videos on our E3Live YouTube channel. Maybe they will spark an idea for you! No inappropriate offensive, discriminatory, or mocking content. No foul language. No promotion or visual of other products. Must put E3Live in title, description and tags. Must put www.E3Live.com in description. COPYRIGHT - You must be the original author of everything in your video or have permission to use copyright protected material. Be creative, but think carefully about what you put into the video. If you are considering using existing music, video clips, photos, etc., it is very likely that someone else owns a copyright to that material. In this case, be sure to obtain the copyright owner's written permission before using the material in your video. GENERAL TERMS AND CONDITIONS - By participating, entrants agree that E3Live and and their respective agents are not responsible or liable for, and shall be released and held harmless from: (i) telephone, electronic, hardware or software program, network, Internet, or computer malfunctions, failures, or difficulties of any kind; (ii) any condition caused by events beyond the control of E3Live that may cause the Contest to be disrupted or corrupted; (iii) any printing or typographical errors in any materials associated with the Contest; (iv) any and all losses, damages, rights, claims and actions of any kind in connection with or resulting from participation in the Contest, including claims based on publicity rights, defamation, or invasion of privacy. E3Live reserves the right, in its sole discretion, to cancel, terminate, modify, extend, or suspend the Contest should (in its sole discretion) computer virus, bugs, non-authorized human intervention, fraud, or other causes beyond its control corrupt or affect the administration, security, fairness, or proper conduct of the Contest. In such case, judges will select the winners from all eligible entries received prior to and/or after (if appropriate) the action taken by E3Live. E3Live reserves the right, at its sole discretion, to disqualify any individual it determines to be tampering with the entry process or the operation of the Contest or the Corporation website. 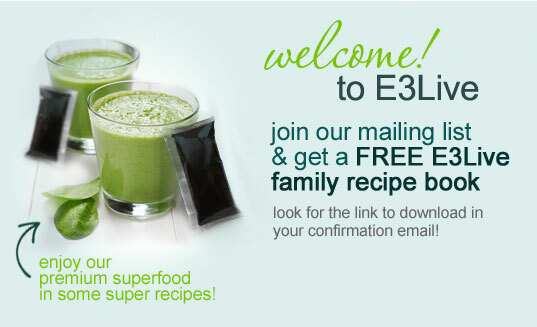 Must submit via Email to sales@E3Live.com with a YouTube link — put Video Contest Entry in the subject line. If you prefer to just email us the video (instead of setting up a YouTube account of your own) then just send it to us in a YouTube-acceptable format (supported file types listed here). You may submit either by email or via YouSendIt for large files, to sales@e3live.com. We will email you back to let you know we have received your video. Some email systems have a limit on what size you can send out, so if you do not receive an email confirmation, then yours may not have come through. A panel of contest judges consisting of E3Live staff will review the videos and rate them, using the evaluation criteria listed below. Using the ratings and comments of the judges, E3Live officials will select five or more finalists. The five finalists' videos will then be available for voting by the general public through the www.E3Live.com website from September 24-28, 2012, and will determine the grand, runner up winners. 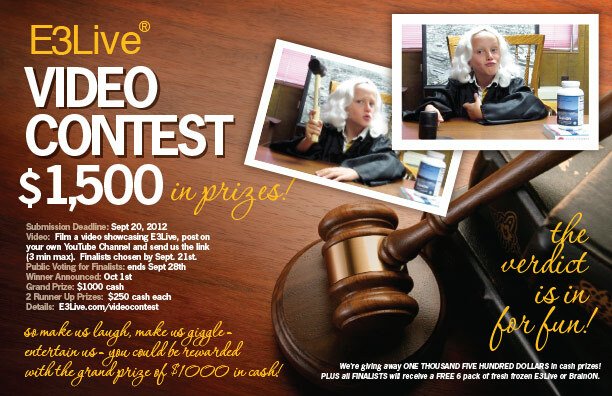 SUBMISSION OF FINALIST VIDEO FOR YOUTUBE CHANNEL - All finalists must submit their winning video by September 24 to sales@e3live.com via www.yousendit.com or via hard copy in DVD format to Video Contest, c/o E3Live, 610 Broad St., Klamath Falls, OR 97601. All entries must be in one of the following formats .WMV, .AVI, .MOV, or .MPG and be less than 100 MB in size. CONSENT OF ACTORS IN YOUR VIDEO - finalists must declare that they have written consent from people featured or identified in their video. Please Note: consent requirements may vary from state to state and each participant is responsible for complying with state consent requirements. PRIZES - Grand Prize and Runner Up Winners will notified and informed of how they will receive their cash prize the week of October 15, 2012.